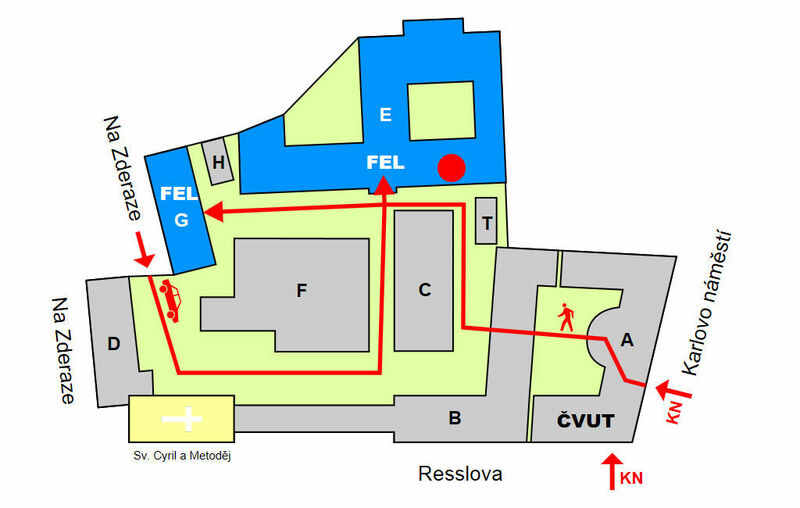 We are located in the first floor of building E in labs starting from KN:E-117 to KN:E-123 (marked by red dot on map of CTU building complex at Karlovo namesti below). After entering the complex via the main entrance in building A, continue straight forward till you find yourself on a coutryard. From there, continue to the right and enter building E. Take steps to the first floor and navigate left. You will find us on the right side of the hall. For car or city transport directions from the airport, the main train station (Hlavní nádraží) or the Holesovice train station (Holešovické nádraží), visit https://cyber.felk.cvut.cz/department/contacts/.